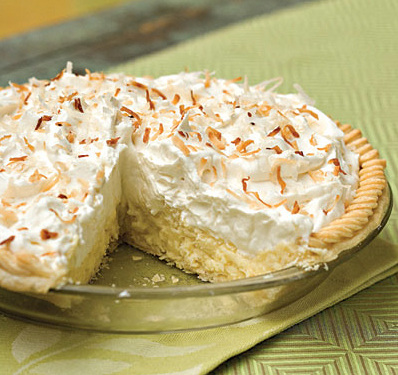 Happy Coconut Cream Pie Day! Happiness=Coconut Cream Pie. May 8th is dedicated to this pie. I don’t know if this is a act of Congress, but if it is, it’s the smartest thing they have done all year! It’s my favorite pie, no question. I can only eat this a few times a year, or it loses its special-ness. And I have a few demands… It can’t be frozen, or have a meringue top, the coconut on the real whipped cream topping must be toasted, and the crust shouldn’t be graham cracker. These are just my odd specifications. You should enjoy it any way that you please. This is the best and easiest recipe I’ve found. It’s from Southern Living, of course. The only way I change the recipe is to put a little less whipped cream on the top, since I’m more fond of coconut than whipped cream. Yum! Photo courtesy of Southern Living Magazine. Posted in baking, coconut, references, recipes. Bookmark the permalink. Thanks so much for stopping by. Please let me know the results.